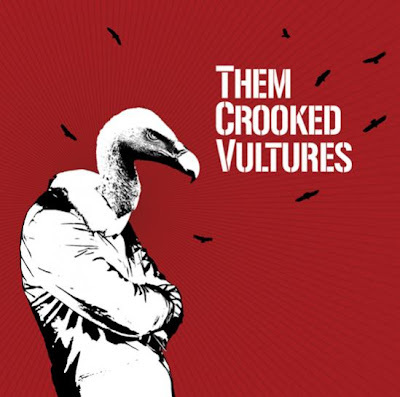 The super trio of Josh Homme, Dave Grohl and John Paul Jones, Them Crooked Vultures, posted their new single, "New Fang," a couple days ago. To put it obviously, "New Fang" is exactly what you would expect from such a direct marriage between Zeppelin and the Queens, a happy and heavy thump thump that incorporates Homme's grab bag of inspiration with Jones's natural arena blues inclination. Abandoning the Foo Fight for a little while, Grohl seems to typically mesh well with Homme, as QOTSA's Songs For The Deaf readily and ably confirms. With "New Fang" a decent enough preview, I think it's safe to say that Them Crooked Vultures sounds more exciting and dignified than a Zeppelin reunion would have. Their self-titled debut will be released November 17th on Interscope.